Crump Theatre Midnight Hunt...Come join us!!! Description: Crump Theatre Midnight Hunt...Come join us!!! 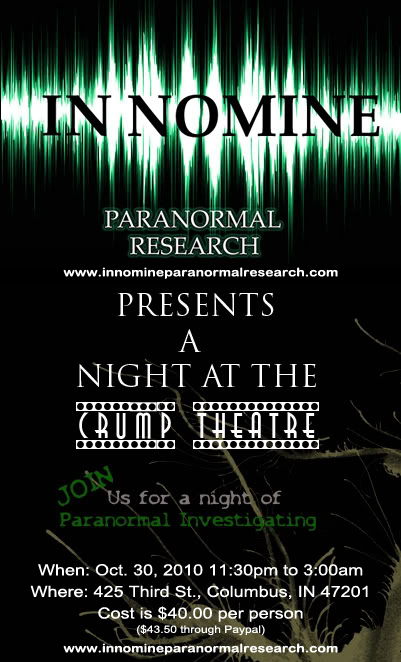 IN NOMINE PARANORMAL RESEARCH will be doing a hunt at the Crump Theatre in Columbus, Indiana and we are allowing guests!!! In a building dating to 1874, John Crump opened his Opera House in 1889. In 1914, the first movies were shown, and not long afterwards, the Opera House was renamed the Crump Theatre. In 1934, seating was increased when the orchestra pit was removed, and the same year, the Crump was nearly renamed the Ritz. The Crump underwent a thorough renovation in 1941, when it was redesigned in Art Moderne style, including its dramatic facade, with its two-story tall vertical marquee, illuminated by chaser lights. The Crump remained popular for decades, until declining ticket sales forced the theater to close in 1987. That year, the old theater came close to being demolished, but fortunately was spared. Since 2001, the Crump has been undergoing a restoration project, with the facade's repairs completed by late 2001, it's marquee lit up for the first time in many years during that year's holiday season.